The initial meeting enables couples to make an informed decision whether the process is consistent with their expectations; whether divorce mediation is the right choice for them; and whether they feel comfortable with the particular mediator. After the initial meeting, if you decide you wish to participate in the mediation process, an appointment for your first mediation session will be set, and you will be advised about the information that will be needed to proceed. 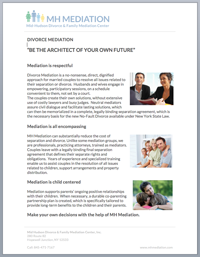 If you and your partner are trying have an amicable divorce, mediation is probably the right choice for you. Part of the strength of mediation as a means to settle disputes is that both sides are able to have their point of view and needs fully heard and understood. No decisions are made by an outsider — the neutral mediator assists the parties in finding a mutually acceptable solution to all issues that have to be addressed. Guidance is provided to enable the participants to address relevant issues and explore alternative choices, most frequently culminating in acceptable solutions that both endorse. This process occurs in a neutral setting, where all participants are expected to engage in a courteous, respectful and focused dialogue. Issues encompass those that naturally arise when parties anticipate separating and/or divorcing, as well as post-divorce modifications. At the first mediation session, the parties and mediator begin organizing all relevant information so that both parties and the mediator are fully informed before decision-making begins. Well prepared parties usually complete that informational process in one or two sessions, a prerequisite to being ready to explore possible mutually acceptable decisions. All issues relevant to the separation and divorce are considered and ultimately decided by the couple. If there are any urgent or immediate problems, including those involving finances, living arrangements or children, temporary agreements may be entered into for the duration of the mediation process. The average couple has between three and six meetings with their mediator in order to come to a complete agreement about all issues. Once the agreement has been reached, our mediators will draft a separation agreement and forward it to the parties for their review. Parties are free to have their independent attorneys review the agreement and provide any additional advice. The parties then return to mediation to review any further issues and finalize the agreement.